have an equal amount of passion for teen culture and indie music culture; so when the two worlds collide it’s a safe bet that I will be seek out whatever book, movie, website, ‘zine, or piece of music is the resulting product. 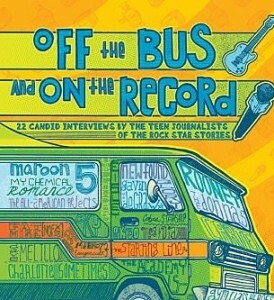 As a former teen journalist, I was super psyched to check out the new book Off the Bus and On the Record: 22 Candid Interviews by the Teen Journalists of the Rock Star Stories. I love it when teens create their own media and it must have been a dream come true for these teens to make a mission out of interviewing some of their musical idols. The book collects interviews conducted by the young journalists of the TV show The Rock Star Stories. The program began when siblings Amanda and Jaime Rich were asked to host a teen-oriented music TV show in Florida called Swept Away TV. They invited their other siblings Zac and Brittany to help out behind the scenes and the show grew from there, ultimately airing around the country, online, and on college campuses. Eventually they started a non-profit that works to help train other young people in media creation. Their book collects some of their favorite band interviews (including The Donnas, All-American Rejects, Fat Mike from NOFX, and Fall Out Boy), many of which were conducted when some of the journalists were young teens. I was curious how this group of young music fans discovered new music and if radio (especially college radio) played any part in their lives. To learn more about their take on music discovery, music journalism, and what it’s like to be young and interviewing rock stars; I had an email chat with Brittany and Zac Rich. I also got some perspective from the author of the book’s foreward: Aaron Burgess. Aaron used to be the editor of indie music staple Alternative Press and he sheds some light on rock journalism across the generations. Spinning Indie: How do you learn about new music? Brittany Rich: I listen to some of the obscure channels on satellite radio and listen to all kinds of music on Myspace. I also get recommendations from my friends who have all kinds of musical interests. Thanks to the Web, it’s just gotten a lot easier to learn more, faster, about new bands, and to go deeper than that to learn about things like the bands that inspired them and the genres, concepts and other big ideas that tie everything together. All that said, I still like having to work to learn more about bands that interest me, and I love to be surprised when a band I never could’ve imagined existing comes completely out of left field and sets me off on another tangent. Spinning Indie: Do you listen to radio? college radio? Brittany: I listen to Sirius radio in the car and some local rock radio but we don’t have a lot of alternative or even rock on the radio in our area. When I move into the dorms this year at college I will probably start listening to college radio. Zac: Sirius Radio and Internet Radio. Aaron: I don’t actively listen to commercial radio at all, and I listen to college radio primarily online while I’m at work. I love being able to sit at my desk in Texas and listen to a station in Ithaca or Pittsburgh or Washington—although I have to admit, I don’t listen to college radio as much for discovery as I do to affirm whatever tastes I might be pursuing at the moment. When it comes to discovering new music, I visit a lot of music blogs and MP3 blogs, and I really like reading customer reviews at sites like Amazon and staff write-ups at stores like Aquarius and Amoeba. I’ve been relying on Twitter for new-music recommendations a lot lately, too. I’m aware of the irony here, but even though I review music professionally, I hardly ever look to professionally written reviews to give me the best insight into whether I’ll like a new record. Spinning Indie: How do you think being an on-air (TV, video) journalist different from being a print journalist? Have you guys done both? Brittany: I have done both but on air is much harder because you have to react in the moment to what the interviewee is saying. You also have to keep focused in spite of what may be going on around you. Your body language also is important on air. You want to give the same impression with your words and your actions. Zac: Being on air makes you have to think really quick on your feet. You have X amount of time on camera and every move you make [and] question you ask gets shown on the tape. So you have to be really focused and able to think quick on your feet. No matter how much you get ready for an interview it won’t have any effect if you lock up on camera and forget everything. Aaron: I have a lot of respect for the Swept Away crew for having the guts to hone their chops on-air. I wouldn’t go so far as to say that anyone can do print journalism – interviews full of social awkwardness and dead air can be just as painful to experience when they’re not being broadcast live. But I do think that you have a tougher job as a TV or video journalist because you have to be totally present while your subject is in the spotlight. You have to be ready for anything in ways that a print journalist doesn’t, and you have to be hyper-aware of things like timing, appearance, composure and rapport in ways that you don’t have to when you’re interviewing someone for print. With print, you can edit a terrible interview to look like something that flows. On video or TV (or even radio), the camera won’t let you lie quite as easily. Spinning Indie: I see that your ventures now include radio. Is that relatively new and how do you like doing a radio show compared with TV? Zac: I been doing Internet radio for the last 5 years, it’s a uncensored talk show aimed at college students. It’s nice to be on the Internet because of the freedom of being uncensored and being able to say whatever we want. Spinning Indie: Do you think teens and young adults are better interviewers/journalists than older folks? Why? Zac: Yes! for starters we care more about who and what we’re interviewing because most of the time the band plays a role in our lives. Either we hear their music every day or we [or] our friends talk about them every day. Also because a teen or young adult journalist isn’t as threatening to a band as a someone from NBC or ABC or MTV. To them we are just fans, but with a great job! This makes most bands open up more and tells us some really great stories. Aaron: I really think it depends on the interviewer more than the age of the interviewer. In order to be a great interviewer, you really need to understand people—what makes them tick, how to unlock them—and for a lot of us, this sort of empathy a skill that only comes with time, experience and a lot of personal ups and downs. That said, I’ve met a lot of teens who are wiser beyond their years than I ever was at that age, and I’ve met a lot of adults who continue to act like the stereotype of a dumb teenager. As one of those “old folks” myself, I can attest to the fact that age has brought wisdom and a wider sense of empathy for the people on the other side of the microphone that I might not have had when I was a 16-year-old doing my first interview. Knowing what I do now, I can only imagine how much better some of those early interviews would’ve been. Spinning Indie: What do you love about music journalism? Brittany: I love the excitement of discovering a new artist and telling everyone about him or her. I really like when other people discover an artist that I really enjoy listening to. I like to share!!! Aaron: I love getting beyond the music to understand more about the people who make it: their ups, downs, strengths and flaws. I love learning what makes people tick and being able to get insight into how great musicians become great. I love learning that my favorite artists are people, too, and I love it when I can get someone to open up about not just how they got from point A to point B in their craft, but how there were all these other factors that allowed them just to find where point A was in the first place. Beyond all this, though, I love being able to come back from an interview or assignment and have the chance to share what I find with other people. Spinning Indie: What has it been like being a young female journalist interviewing mainly male musicians. Have you found the indie music scene to be welcoming? Brittany: It can get weird and the guys can get really sexist but for the most part everyone has always been totally cool and nice. We keep it professional and music related or least we try to. Most indie artists are so appreciative of us trying to promote their music and it shows in their interviews. I started doing this when I was in 6th grade and back then I felt very self conscious and shy. After so many years nothing phases me anymore-even weird Jeffree Star! Thanks to the crew from The Rock Star Stories for sharing their pasV-Mate Portable DVR – Record TV To Go!I have an equal amount of passion for teen culture and indie music culture; so when the two worlds collide it’s a safe bet that I will be seek out whatever book, movie, website, ‘zine, or piece of music is the resulting product.